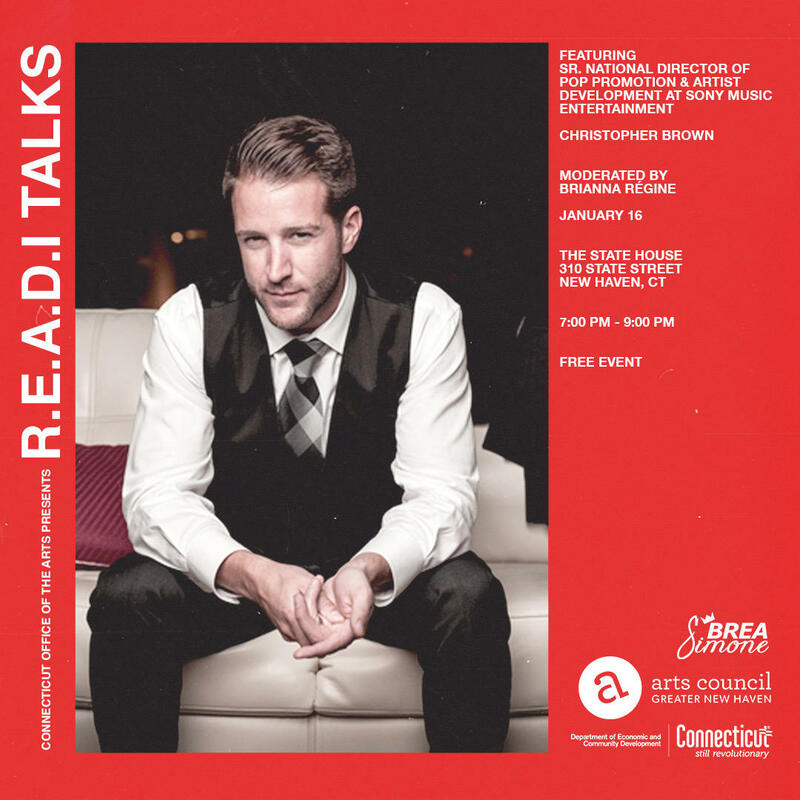 On January 16, 2019 at The State House, Connecticut Office of the Arts presents you with a chance to experience a 1:1 in depth conversation with Sr. National Director of Pop Promotion & Artist Development at Sony Music Entertainment, Christopher Brown. Brianna Regine will moderate the discussion tapping into Christophers's insight on what goes on behind the scenes in labels as well as give an in depth breakdown of streaming and what they need to do to get in front of the right individuals. The audience will be able to engage in the conversation while being able to ask questions towards the end of the discussion. The event is free of charge and will have a cash bar available for 21+ patrons. Snacks will also be available for purchase. RSVP is required for entry. Those without an RSVP will not be admitted into the discussion. RSVP now to secure your seat as space is very limited for this experience. Sony RED’s Senior National Director of POP promotion Christopher Brown brings an in-depth look into the worlds of radio and streaming. With a repertoire of artist like Fergie, Flume, Logan Henderson, Nina Nesbitt, MAX, Daya and LovelyTheBand to name a few. Chris offers insight into the Modern music industry with 14 platinum records under his belt and more on the way. Christopher has worked hard to secure radio and dsp airplay in the United States. He also spends a lot of his time to come up with creative and compelling ways to promote artists and music primarily by utilizing relationships, communications skills, and compelling information/statistics to garner airplay. A major area of his position is persuading partners that may not feel this is the best fit / sound for their station or market. Chris strives himself on developing strong working relationships with various music outlets within their market such as: clubs, concert venues, etc. Brianna Régine is a brand strategist & publicist, blogger and millennial goal digger who empowers others to execute their ideas and blossom into their fullest potential. As the founder and head lady-boss of Brianna Régine Visionary Consulting, LLC (BRVC), Brianna increases the exposure of entertainment, lifestyle and beauty brands through brand development, digital marketing, event coordination, and public relations support. Since February of 2017, BRVC has collaborated with its clients to produce: recognition from national as well as international print, broadcast and digital publications; acknowledgement from influential platforms such as A3C; relationships with various brand partners and more. Brianna is dedicated to creating an authentic and long-lasting legacy that supports the growth and execution of innovative visions. "This event gives people a chance to get answers in regards to this industry from someone who is unfiltered. These type of conversations need to happen more but most are afraid to keep it that real. I am not. " "We use R.E.A.D.I (relevance, equity, access, diversity, inclusion) as a tool at the CT Office of the Arts to make sure we are being diverse not just in the communities we serve but also in our programming. R.E.A.D.I talks are designed specifically to continue to reach those from the young creative professional audience who are seeking to build a career in arts and entertainment. The talks are meant to inspire, educate and gives resources to those interested in this sector of arts."